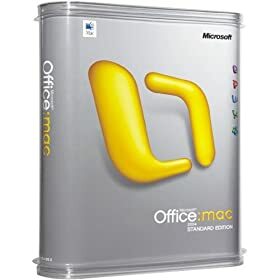 Office 2004 Standard is designed to be a total office package, for Mac users who need compatibility with Windows. Start working with the latest versions of Excel, Outlook, Powerpoint, and Word - with all-new Mac-only features, for a more productive office environment! Add sophistication to your Word documents Soft Drop Shadows Word Smart Buttons allows users to decline the automatic corrections, bulleting and numbering New Presenter Tools for Powerpoint - tools like the on-screen clock, notes pane and thumbnail viewer make changes and adjustments simple Entourage 2004 offers improved junk e-mail protection, better Exchange support, advanced Three Columns and more -- get through your inbox faster than before Compatibility Reports determine compatibility between projects in Windows and Mac formats Stay in touch with MSN Messenger for Mac.